What is Combined Decongestive Therapy ? This is best understood by first looking at a deeper level into the anatomy and function of the lymphatic system. The lymphatic system is part of our immune system and it has many functions. It is designed to transport our defence cells around the body allowing them to locate and fight bacterial invaders. The lymph nodes also play their role in defending the body by providing the correct environment for the creation of new lymphocytes (white blood cells), functioning as filtering stations for the breakdown of harmful bacteria and as storage facilities for non-organic materials (such as dust and dyes) which the body cannot process. An efficient lymphatic system ensures healthy connective tissue and swift removal of bacteria and pathogens. Unfortunately, for some people, the lymphatic system is disrupted. The condition known as primary lymphoedema can manifest at birth, puberty or in later life and may be due to either poor development or an absence of some lymph vessels. In secondary lymphoedema the condition may develop due to vessels becoming damaged or severed or lymph nodes being removed during surgery. It can also appear after infection or severe physical trauma. The lymph fluid accumulates and "backs up" in the connective tissue and results in the visible swelling which is so indicative of those with lymphoedema. Combined Decongestive Therapy can help with both primary and secondary lymphoedema by increasing the flow of lymph away from affected areas and into healthy lymphatic vessels to then be processed through the nodes. In addition it can help by breaking up fibrosis (deposits of firm scar tissue) and thus increasing the channels available through which the fluid can move. 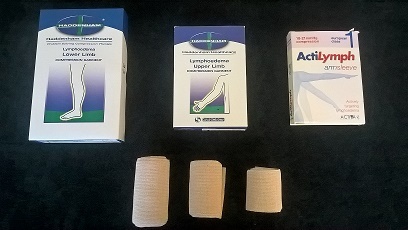 Manual Lymph Drainage, compression bandaging, skin care, compression garments and exercise. All of these will be discussed at the initial consultation as well as advice on the frequency of treatments and then subsequent maintenance treatments and homecare. There is another medical condition which, although has very similar properties to lymphoedema, is actually a disease of the adipose (fat) tissues. This is called lipoedema and it almost exclusively affects women only. It is characterised by disproportionately heavy hips, thighs and legs which, in later stages of the disease, stops at the ankle (like a cuff) leaving the feet unaffected. Legs can be cold, bruise easily, tender to touch and can at times feel very heavy and painful. If this sounds familiar please get in touch and we can have a chat or an assessment and I can hopefully give you some assistance towards getting a proper diagnosis for the condition along with lots of self-help ideas.